It’s all swell in Camberwell, not least around our belt buckles, after a gut-busting, button-popping blow-out of a Sunday lunch at gastropub The Camberwell Arms. If Sunday lunches are designed to do anything it’s to put you flat on your back until well after the Antiques Roadshow. Fiona Bruce was already looking like a long shot halfway through the main course. 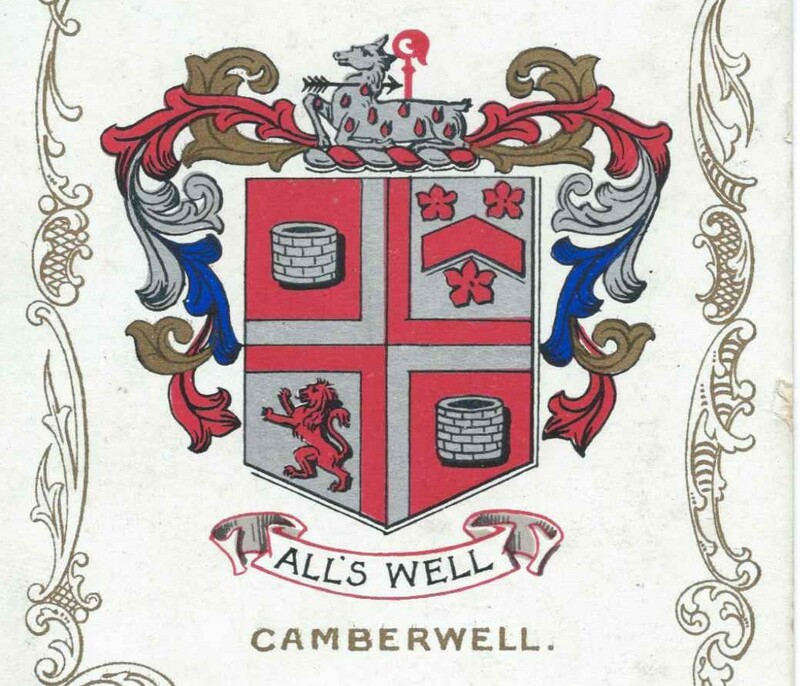 For that alone The Camberwell Arms deserves thanks. Camberwell has “come up” in the last few years. The number 148 bus started attracting perplexed-looking people who had clearly never used above-ground public transport before. Legendary “slit ‘n’ sawdust” tough pub The Silver Buckle (known as The Silver Knuckle) sank to its knees and was re-opened as a friendlier punch-up-free Tiger. Wing Tai oriental supermarket on Denmark Hill (the wet fish guy in there had mesmerisingly good cleaver skills) became, horror of horrors, a Costa. The bingo and snooker halls went the way of all flesh. Windswept and litter-blown Camberwell Green is currently a boggy no-man’s-land in the throes of landscaping. Despite these changes, Camberwell remains a ragged, exhilarating slice of truly mixed inner London life. From the Lord-of-the-Flies-style displays of pig heads in cheap-as-chitterlings Christine’s Meat and Fish on Denmark Hill to the provocative modern art exhibitions at the South London Gallery; from the rough and ready but ultra-friendly greeting you’ll receive in the Nags Head pub on Camberwell Road (not to mention light-touch enforcement of the smoking ban) to the chandeliered splendour of gastropub The Cambria, Camberwell remains an area poised nervously between one grimy, raucous, bus-choked aspect, thronged with chicken shops and African supermarkets, and another, all bohemian, artistic and Georgian-terraced. And now a new, more monied, professional crowd have settled, seeking zone 1 perks (coffee, craft beer, cronuts) in one of the last (barely) affordable pockets of inner London. The Camberwell Arms is full of the new Camberwellites. It serves their needs – unpretentious, fast, comfortably and radically traditional. By that I mean that Brussels sprouts are on the Sunday lunch menu – but they’re deep fried and served with pickled red onions, crumbs and thyme. It’s an airy, aubergine-coloured Victorian alehouse, slickly run by the team behind The Canton Arms in Stockwell and The Anchor and Hope in Waterloo. And it’s clearly, judging by the exuberant crowds, still buzzing from bagging its “Best Sunday Lunch” trophy at the Observer Food Monthly 2015 Awards last month. Without a reservation, we were early and lucky enough to claim coveted seats at the bar, with a grandstand view of the now obligatory open kitchen. No evil eyes from the patiently waiting hordes (many with children) behind us – with Belleville’s Battersea Brownstone ale on tap and a thoroughly modern and tolerant invitation to vape in the bar area, why would there be? Service was fast, friendly and efficient. 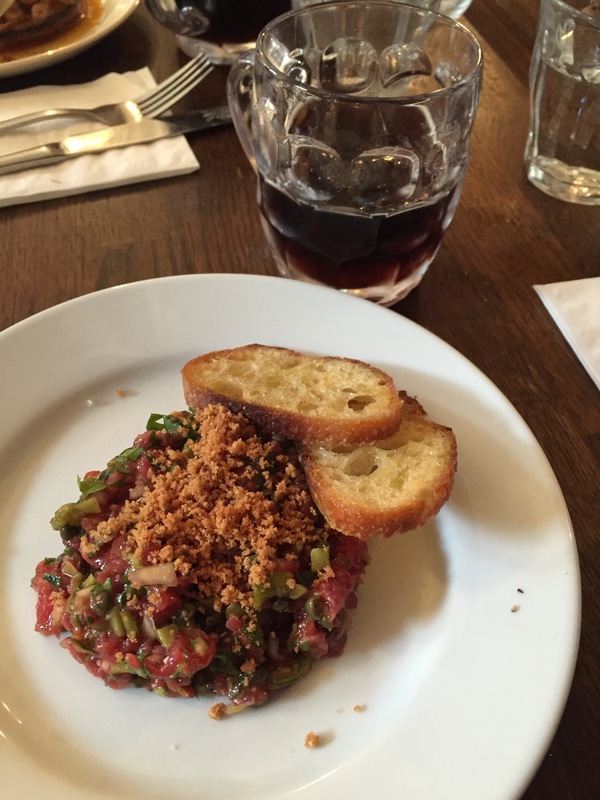 After complimentary bread and butter, a steak tartare proved textbook clean and peppery-tasting, feisty with Tabasco and anointed with toothsome dripping breadcrumbs. 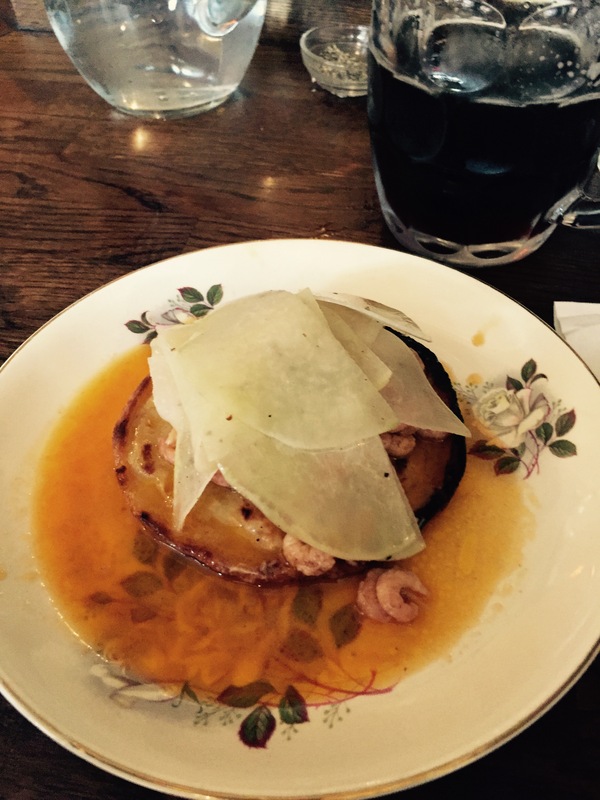 Even better was a chargrilled crumpet topped with tiny, nuggety shrimps tucked up sweetly under thin sheets of kohlrabi and roused by a ladleful of buttery, orange-zapped sauce. Brilliant textures, with the crisp, soot-blackened edges of the crumpet holding up against its own fluffy and sauce-swollen, shrimp-laden centre. Sharing dishes abound here – there are mammoth pies, stuffed with Hereford beef, ale and bone marrow, a spitroasted chicken, served with wholegrain mayonnaise and gravity-defying piles of roast potatoes, and a bloodily-good looking four-year-old Hereford sirloin for two, bone-in. Wanting to try as much as we could on the menu without having a coronary, though, we plumped for a separate courses instead. 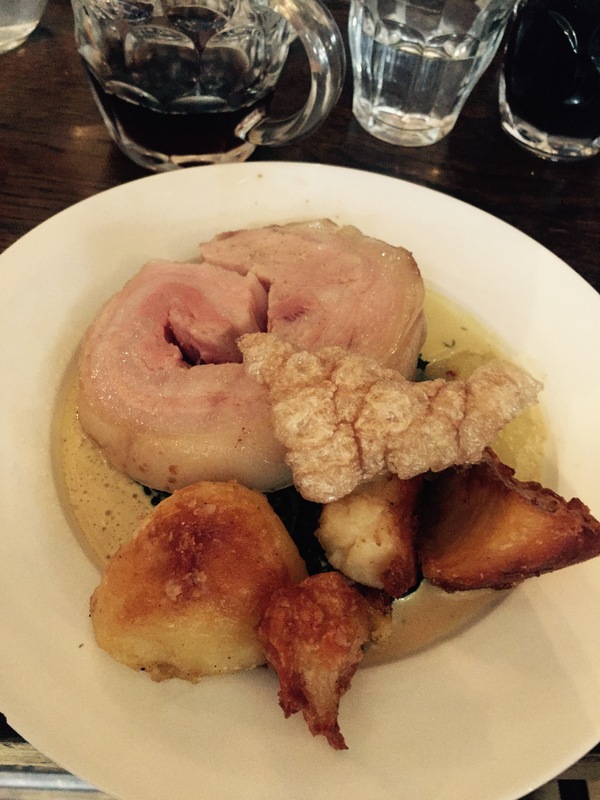 The regal-looking potatoes we’d seen borne past accompanied the pork, an unctuous, bright pink halo of poached belly. Roast potatoes ordered out rarely live up to the standard you can reach at home. Pale, greasy, oversized, too often they’ve been finished off in the microwave. These spuds had been treated with the requisite patience to transform them into gnarled hunks of gold, shatteringly crisp on the outside, bright white and fluffy on the inside. Black cabbage, crackling and a cream sauce rich as Croesus finished the dish, and my hopes of staying awake in the passenger seat on the way home. My companion was presented with a mountain of chargrilled squid. 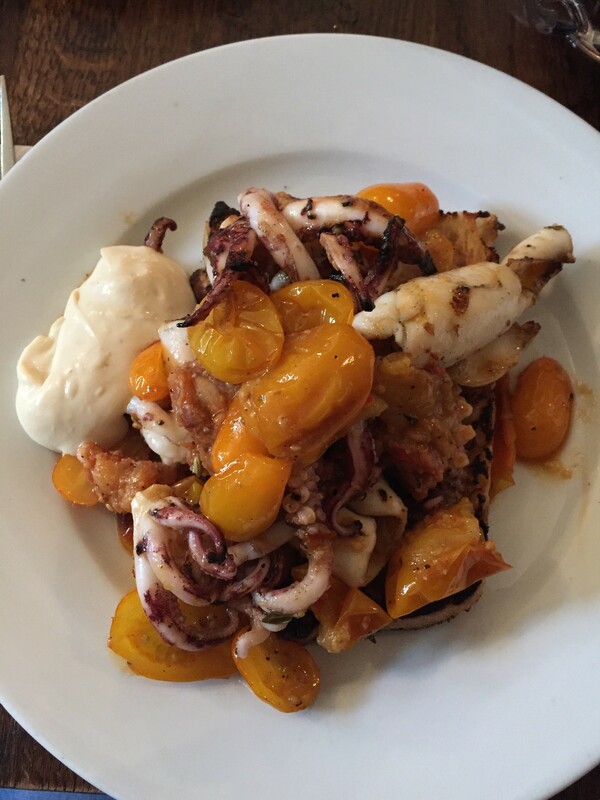 On a piece of blackened bruschetta, the perfectly scorched undersea beasts had been depth charged with nduja (the fiercely spicy, soft Calabrian sausage) and thick aioli while orange datterini tomatoes (‘little dates’ in Italian) strafed the tongue with little explosions of intense sweetness. 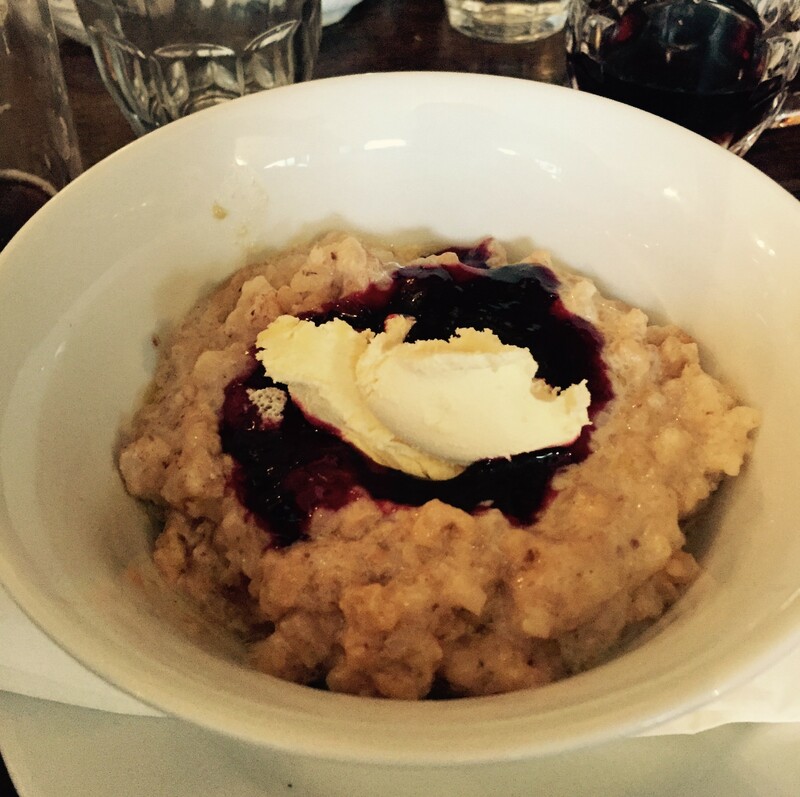 After this thrilling and filling dining, a daintier dessert may have been more appropriate, but perversely I opted for the baked rice pudding, emblazoned with jam and, the finishing touch, a scoop of clotted cream. The grains had lost most of their bite and my desire to expunge hurtful childhood memories of rice pudding was not quite fulfilled, but it was a calorific roundhouse ending all resistance to going home and lying down in a dark room. 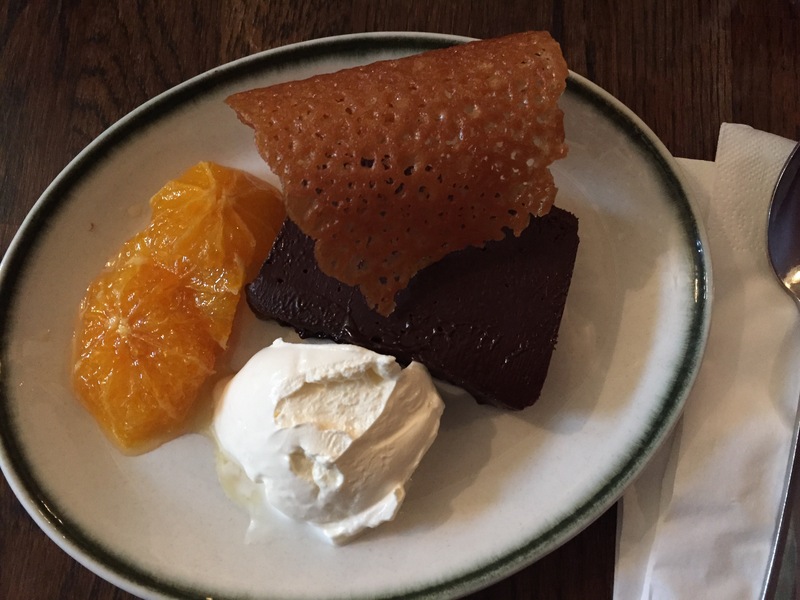 Our other choice was chocolate terrine denser than a dark nebula, partnered with clementine, creme fraiche and a brandy snap. Dinky, delicious and deceptively filling. With a fascinating menu that demands to be given greater attention, the Camberwell Arms seems destined to be on our Sunday lunch hitlist for some time to come, and the Antiques Roadshow to remain just a fond memory. The Camberwell Arms, 65 Camberwell Church St, SE5 8TR. 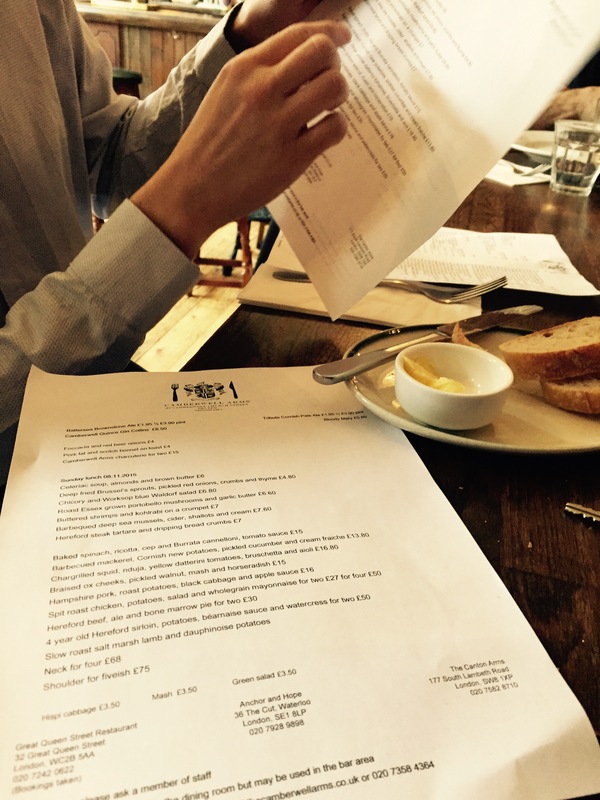 Price for lunch for two with beer, including service charge, £77. This entry was posted in Camberwell, Eating and tagged in camberwell, camberwell arms, camberwell pubs, London, london gastropub, london pubs, London restaurants, south east london, sunday lunch.